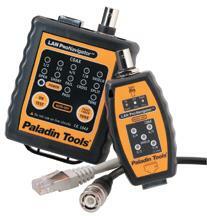 Paladin's LAN ProNavigator™ Tester and Remote features a one button, simple one second testing (Pass/Fail or Fault find) allowing technicians to quickly move on to the next test site. 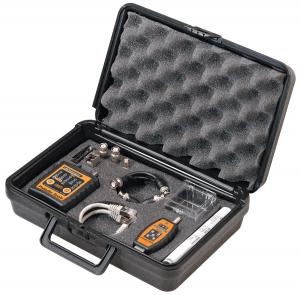 This tester traces wires with tone and remote lights and offers a quick fault analysis on coax and data cables. Generates oscillating audio tone for use with tone probes to locate cables. Tests data and telephone cables up to 320 feet (100 meters) for proper pairing for EIA/TIA-568A, EIA/TIA-568B, Token Ring, 10 base T, and common category 5 configurations. Tests unshielded UTP and shielded STP data cable. Tests common BNC connected 50 to 75 ohm coaxial cables up to 320 feet (100 Meters) for continuity. Tests coaxial cable types RG58, RG59, RG6, RG6 Quad, Clark CV752, RG8, RG11, and more. Belt clips provided and lanyard holes embedded in case to attach to belt or wrist. Features low battery test and auto off function to preserve battery life. Includes standard 9V dc battery. Dimensions 3.45" x 2.9" x 1.85 " 3.45" x 1.6" x 0.9" 8.5" x 7.6" x 3"